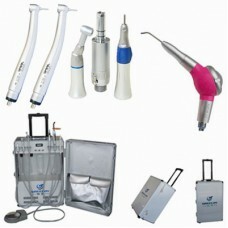 Curing light for dentist is used for the polymerization of light-cured resin-based materials. In the contemporary world of dentistry, curing lights have become an integral part of all specialties and dental practices. Today, almost all resin composites, dental adhesives and adhesive cements utilize light energy for complete polymerization, which further determines the long-term clinical success of a procedure. Using a curing light accomplishes two things. In the first place, it makes sure that the resin cures properly and adheres evenly. When applying fillings, this is critical to keep the filling in place in the mouth. For sealants, the curing light limits the risk of cracks and other problems with the sealant. With adhesives for implants and braces, the rapid, even cure is also designed to limit problems in the future. There have been significant improvements in the curing light technology in recent years. Today, dental equipment manufacturers can develops variety of curing lights, from plasma arc to argon laser curing lights. That said, two curing lights commonly used in the dental operatory are Quartz Tungsten Halogen (QTH) lights and Light-emitting diode (LED) lights. Quartz Tungsten Halogen (QTH) lights. These lights have a quartz bulb with a tungsten filament that irradiate both UV and white light, which must be filtered to remove heat and all wavelengths except those in the violet-blue range. The lights have broad emission spectrum of approximately 390 nm to 500 nm, which is capable of curing all composites.